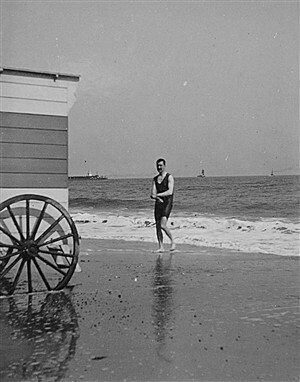 "The daring people who did swim did actually use the old bathing machines and I can remember them quite clearly, yes... (This was Yarmouth? )Yes this was Yarmouth there was some just south of the Britannia Pier and I remember as a naughty little boy they had big cart wheels at the back and smaller ones for steering at the front and they were pulled in by horses and I remember climbing up on the big cart wheels at the back trying to peep through the little slotted windows when I was a little boy." This page was added by Richard Dade on 28/01/2007. As tomorrow, 25th January 2014, marks the 150th Anniversary of the birth of my great, great grandfather William Adams I thought that now would be a good time on which to add some notes regarding the photograph (above) of one of Mr Capps’s bathing huts. I originally spotted this photograph in a local history book about seven years ago. 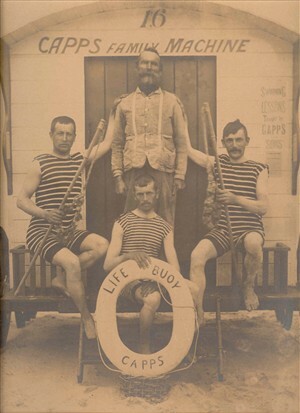 At that time I was convinced immediately that the gentleman on the left of the photo was my great, great grandfather William Adams (1864-1913), a famous lifesaver whose headstone records him as having saved 140 lives from drowning off Gorleston beach. The same photo was donated to the Yarmouth museums in 1978 by a descendant of Mr Capps. The caption in the book Great Yarmouth: History, Herrings and Holidays, by Charles Lewis, says it shows “Grandfather Capps, two sons and an assistant” on Gorleston beach circa 1890. I presume this caption was gleaned from details on the back of the original photo. My understanding is that Mr Capps introduced the first bathing huts on Gorleston beach and I have a Yarmouth Mercury cutting from August 1882 which mentions the fine bathing “accommodation” provided by Messrs Capps and Cooper. Also I have a Yarmouth Mercury cutting showing that William Adams began his own bathing machine/swimming tuition business on Gorleston beach in 1891. By then Adams had already saved a great many lives from drowning off Gorleston beach. His first rescue was in 1875 when he was just 11 years old! William Adams was known in the local press as ‘the Hero of Gorleston Pier’ and as ‘Professor Adams’ for the expert swimming tuition he provided. Adams is one of only four people to be awarded with the bronze medal of the Royal Humane Society with three bronze clasps. William Adams also has the rare distinction of having his name appear twice in the Carnegie Hero Fund's World Roll of Heroes. Although I can find no written evidence that he worked for Mr Capps, I am 99.9% sure that it is William Adams on the photo as I strongly suspect that he was working on Gorleston beach in summer from as early as 1884. It would therefore seem perfectly feasible that William Adams worked for Mr Capps before striking out on his own in 1891.